Langkawi (Malaysia) – September 146, 2018 (travelindex.com) – For the 3rd time, World Tourism Forum Lucerne organized the WTFL Start-Up Innovation Camp, this year integrated in PATA Travel Mart 2018, with the aim of finding revolutionary and innovative ideas in the travel, tourism and hospitality industry. After two evaluation rounds, the 15 most innovative Start-Ups have been chosen as finalists and invited to present their business models at WTFL Start-Up Innovation Camp on 12 September in Langkawi. Finally, the international jury rewarded the winner in each of the five application categories: Destination, Hospitality, Mobility, Impact and Transaction. The five category winners of WTFL Start-Up Innovation Camp 2018 defeated more than 200 competitors from 54 different countries with their game-changing ideas for the better travel, tourism and hospitality industry. 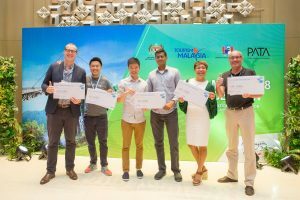 The winners coming from Namibia, Singapore, France and Philippines convinced the jury with the five-minute elevator pitch during the WTFL Start-Up Innovation Camp in Langkawi. VISTA Destination Network Open Platform and Ecosystem democratizes technology and creates competitive advantages for Hospitality and Tourism Businesses, leaving more tourism spend in the Destination. Igloohome designs smart access solutions for smart management of properties and infrastructure. We are an official partner of major homesharing platforms such as Airbnb and have sold our products to over 80 countries. Wingly is the leading flight sharing platform, connecting private pilots with passengers to share their flights, passion and costs. Good For Food’s Smart Dustbin empowers hotels with data analytics to reduce their food waste, cost and environmental footprint. TripClub is a technology-powered concierge currently focused on the high growth blockchain and tech markets. Each winner received a cash check of 15’000 USD and also gets a 2-year coaching programme with an experienced industry executive, a free ticket to World Tourism Forum Lucerne 2019 next May in Switzerland, as well as countless networking opportunities within the WTFL Start-Up community and valuable advice from renowned business leaders and investors. “The competition was tough – not just because of the quantity of applications and wide spectrum of nationalities, but because of the quality and strength of innovative thinking among the young entrepreneurs from the travel, tourism and hospitality industry. We shouldn’t forget that innovation is a major force for sustainable growth, development and healthy competitiveness in our industry,” says the WTFL Chairman of the Jury Roland Zeller, a leading entrepreneur and business angel. WTFL President & CEO Martin Barth is convinced that “new and disruptive business models are essential for the development of our industry. The yearly WTFL Start-up Innovation Camps are platforms that play a vital role in finding these models and giving them a chance to present their ideas in front of the international investors, industry executives and media in order to increase their exposure and build their networks in the industry.” Innovation, exchange of ideas between different generations, diversity and the concern for the sustainable development in our industry are the core pillars of World Tourism Forum Lucerne’s identity. “In the next half year we will make even a step further – we will launch an online deal-flow tool in order for start-ups and investors to find each other, which will complete our activities around innovation and entrepreneurship,” concludes Martin Barth. The successful Camp was able to count on the expertise and support of the Start-Up Innovation Partners, namely The Alpina Resort & Spa, TAK, DSH Caribbean Star, The Travel Corporation, Munich Airport, the International Air Transport Association (IATA) and the host Pacific Asia Travel Association (PATA). “It was inspiring for our delegates and myself to hear from the 15 finalists at the WTFL Start-Up Innovation Camp 2018 during PATA Travel Mart 2018 in Langkawi, Malaysia. Their entrepreneurial spirit and transformative mindsets need to be fully embraced by the industry as we work towards the development of a responsible travel and tourism industry. I would like to congratulate all the winners and look forward to seeing their businesses further develop in the future,” said PATA CEO Dr. Mario Hardy. Founded in 1951, PATA is a not-for-profit membership association that acts as a catalyst for the responsible development of travel and tourism to, from and within the Asia Pacific region. The Association provides aligned advocacy, insightful research and innovative events to its member organisations, comprising 98 government, state and city tourism bodies, 19 international airlines and airports, 91 hospitality organisations and 70 educational institutions, as well as over a hundred young tourism professional (YTP) members across the world. The PATA network also embraces the grassroots activism our 36 Chapters and 20 Student Chapters across the world. Thousands of travel professionals belong to the 36 local PATA chapters worldwide, while hundreds of students are members of the 20 PATA student chapters globally. The chapters and student chapters organise travel industry training and business development events. Their grassroots activism underpins PATA’s membership in Uniting Travel, a coalition of the world’s major Travel & Tourism organisations dedicated to ensuring that the sector speaks with one voice and acts in unison on the major issues and includes ACI, CLIA, IATA, ICAO, WEF, UNWTO and the WTTC. The PATAmPOWER platform delivers unrivalled data, forecasts and insights from the PATA Strategic Intelligence Centre to members’ desktops and mobile devices anywhere in the world. PATA’s Head Office has been in Bangkok since 1998. The Association also has official offices or representation in Beijing and London. World Tourism Forum Lucerne (WTFL) is a unique platform for CEOs, Ministers, Academia, Investors, Start-Ups and representatives of tomorrow’s generation to actively exchange, share, and address the future challenges of the travel, tourism and hospitality industry and to shape a more sustainable future.